Printing fabrics selected to have the maximum chromatic result. A careful study of the colors allows us to have perfect and well defined prints. Lumitex fabrics are printed with high density and high quality UV direct printing machines, which allows to obtain vibrant and saturated colors. The fabrics are finished with a rubber band that allows the insertion of the fabric into the aluminum frames which stretches the fabric eliminating creases. This system does not require any tool or specific skill to replace a graphic, only a few minutes. All fabrics can be shipped wrapped in a custom box with low shipping costs. Backlight fabric with very high color rendering. Use: Backlit graphics up to 3 meter high. Fabric for front illumination with a black back. 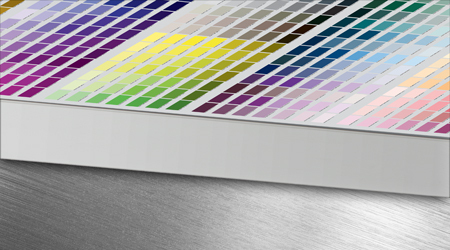 Our color calibrated fabrics allows to obtain vibrant colors and perfect details.